Maybe your ancestor is on this list of veterans who served in the Northampton County Revolutionary War Militia. 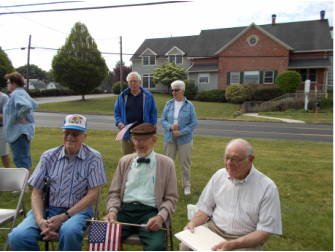 The Lower Macungie Township Historical Society has begun a project to preserve the history of veterans who have served in the Armed Forces of the United States from the time of the Revolutionary War to those currently serving around the world today. Our goal is to assemble a comprehensive collection of photographs, along with biographical sketches, for as many veterans as possible who have lived in Lower Macungie Township at any time in their lives. This information will then be made available to current and future generations for research into this important aspect of our community's history. If you have lived in Lower Macungie Township at any time in your life and would like to be included in this historical collection, please download the form, and follow the instructions. Family members are also welcome to send information about veterans. If you would like additional information, please contact us at lmthistory@yahoo.com. If you know of anyone else who has served or had an ancestor or relative who has served in the Armed Forces, please let them know about this project! Download the biographical information form here (pdf file).